Here is my Organizational Binder for this year. 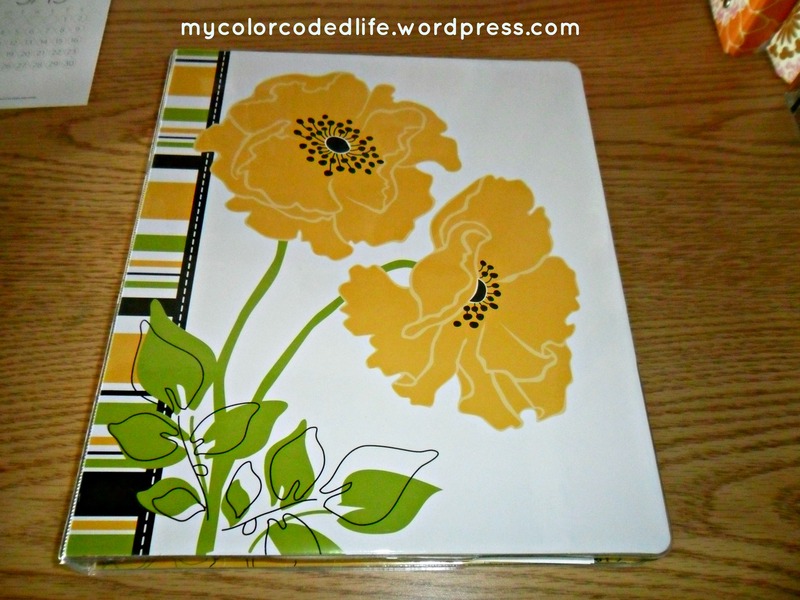 I loved this binder when I saw it at Staples because it was yellow and green – so I knew it would look great in my kitchen! What do I keep in my Organizational Binder? In the front, I keep plastic pouches with our checkbook and envelopes to separate our weekly cash. You can throw away so much money with frequent trips to ATM machines. The machines are on every corner, making it easy to stop every time you need cash. But at $1, $2, sometimes $3 to withdraw, you can end up spending a ton of money, just to get your money! 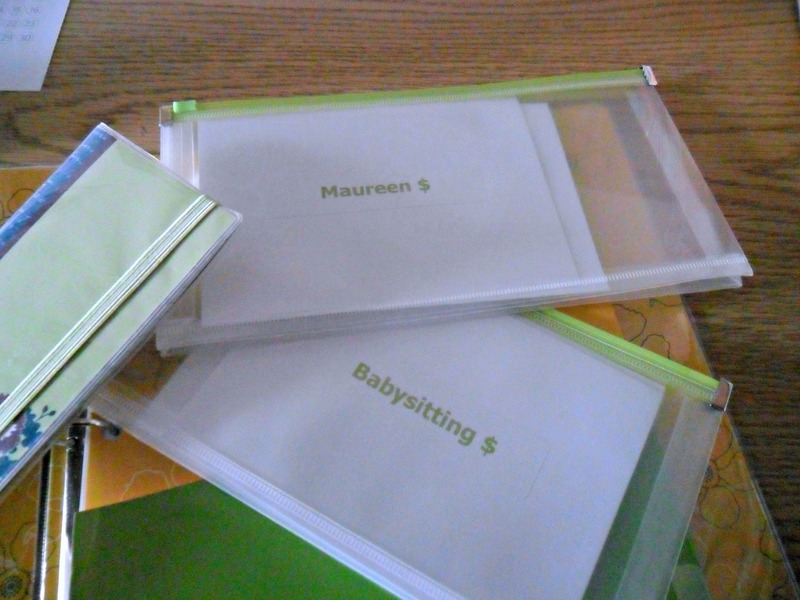 On Sundays, we take out cash we will need for the week, and then put the cash in the corresponding envelopes. We also have an envelope for receipts we need to save. Larry and I each get a certain amount of cash each week – and when it’s spent – it’s spent! No more money until Sunday! 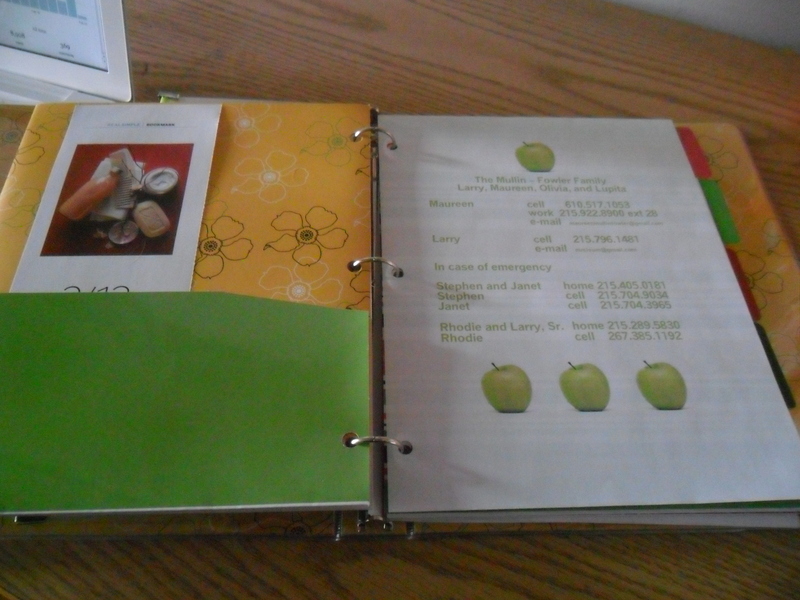 The first page is all emergency and contact information – anything our babysitters would need while caring for Olivia. 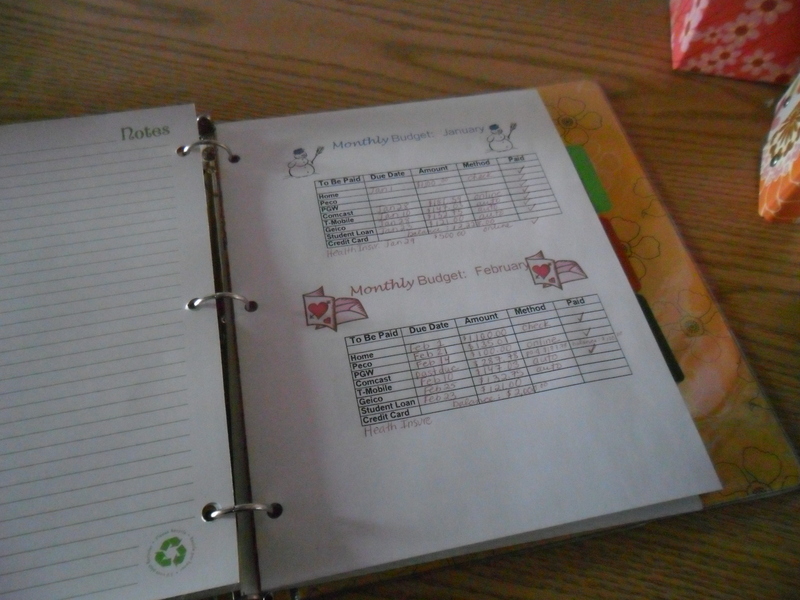 One section includes our monthly budget with a breakdown of all our bills, when they are due, and how we pay them. I always have a Christmas section, since I buy presents all year round. I keep a list of the gifts I bought everyone for the past two years to make sure I am not repeating any ideas. This year we have started something new. I added a cash envelope called Christmas to the front pouch. 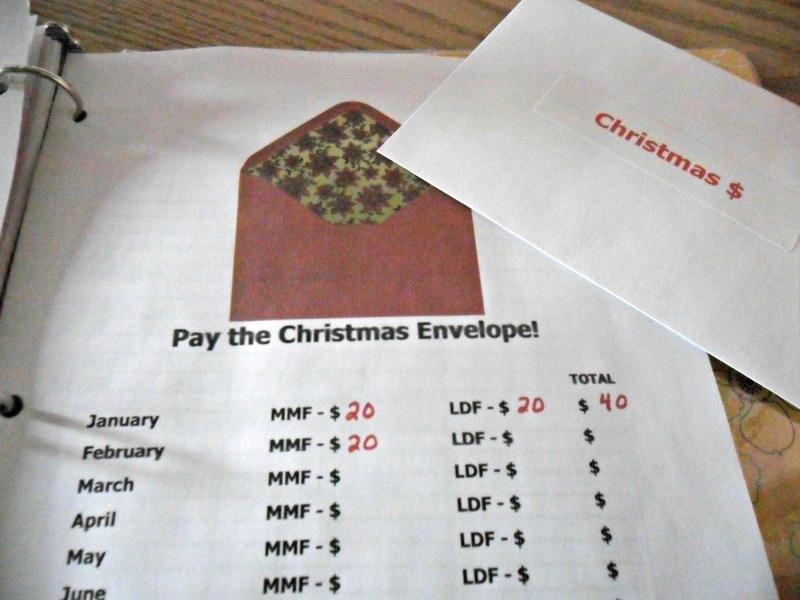 Larry and I each have to pay the Christmas envelope $20 every month. By the end of the year, we will have a lot of extra cash for anything we may need in December. Maybe the grocery bill for the holiday meals, maybe last minute gifts, maybe to help with January’s mortgage! We don’t know yet – but it will be nice to have regardless of what it gets used for! I also have schedules, to-do lists, and places to free-write ideas. 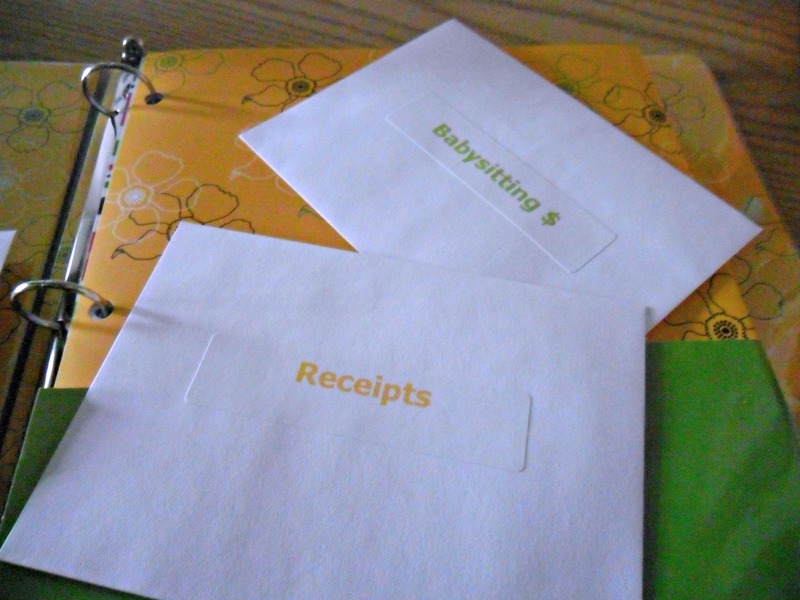 Read here about how I organize all Olivia’s information: Doctor Visits for Baby. Home Binders or Organizational Binders must work for the individual. Whatever it is that you need in one place, or what you use daily should go in your binder. The system has to work for you! Or search on Pinterest for Organizational Binders or Home Management Binders and see thousands of options! Tomorrow I’ll share the binder I am using for the class I am teaching this semester. Do you have a Home Organizational or Home Management system? What works for you? I love hearing about different ways to keep information – so please leave a comment and let me know what works for you. We are getting close to our 400th comment – so you know what that means! A Comment Prize! Keep the comments coming and maybe you’ll be the lucky winner this time! Ben and I have tried all kinds of ways to track the budget….he is the stickler and I needed something easy…we use Mint.com…it is online and has an app for our phones…we have budget categories and they go from green to yellow to red so a quick glance is all i need…love the idea of the cash pouches. I am bad about ATM stops! I have heard a lot of great things about Mint.com — and I know I am a little in the stone ages still writing out my monthly budget and using a calculator! For some reason, that is one way I have not advanced technologically! I’m great with the online calendars (though I was a slow convert!!) I will check it out. The cash envelopes will change you life – seriously! Go online and add up how many times and how much money you spent on ATMs last month. In March, try to cash envelopes and see how much you saved!! Thanks for reading, Megan!! Thanks so much for linking to my binder 🙂 Yours is great-the Christmas gift list is perfect-such a fab idea-love the flowers too!!! Thanks Lish! Hope you get some click-thrus – thanks for letting me share your ideas. Keeping Christmas organized all year round makes me so much calmer in December! This sounds like an awesome idea! I am ready to start one of my own. Thanks Jessica – good luck with creating your binder. Everyone has different ideas and systems – the key is to make it functional for YOU. Include the things you are always looking for, digging out of a drawer, or making copies of. Thanks for following!